Situated near the India-Pakistan Border is the city of Amritsar. Home to the Harmandir Sahib, or the Golden Temple, as it is more popularly known, it is a city of great colour and history. Amritsar, or Ambarsar, as the locals pronounce it, literally means a pool of immortal nectar. There are many ways of getting here. The city is well connected by buses and trains. One can also take a direct international flight and land here. The Harmandir Sahib is of great significance to Sikhs and attracts religious visitors from all over the world. The city is a delight for aficionados of food. In-fact many people who stay near the temple do not cook and prefer to eat out. One gets a sumptuous traditional punjabi meal with a nice tall glass of lassi at a reasonable price. Though in most cases, a single plate should feed two. There are many Dhabas which have not changed for over sixty years. Getting to these places is an adventure in itself, especially, if you do it on foot. Walking through the narrow intertwining lanes we get the feeling that we have travelled back in time and time itself has suddenly come to a halt. One must definitely, try out the Amritsari Kulcha and Firni. There are many hotels to stay and if you contact the temple authorities in advance you could also stay inside the temple. If you happen to be travelling during festivals such as Diwali, Holi or Guru Nanak Jayanti , it would be better to book before you get there, to avoid disappointment. 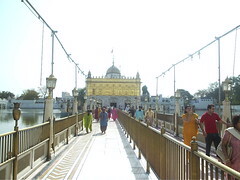 Golden Temple: The biggest attraction of the city in this holy city is the golden temple. One can enter from any of the four entrances. This was part of the design of the temple to show that people from all walks of life and of any religion are welcome to the temple. Once you enter you get a clear view of the dome of the temple which is made of real gold. The temple is well maintained. You can find intricate paintings on the walls inside the temple. These are a treat for the eyes. As you walk inside the temple there is a constant flow of soothing sounds from from the Gurbani. Once you have enjoyed the sights and sounds inside the temple make your way to the langar and have a hearty meal. The temple complex also has a museum inside, which is worth seeing. A warning though, it is not for the faint hearted. There are paintings of war and torture. Also on display are weapons which were used by the Sikh warriors. The temple also has rooms around the lake which are built below the ground. They were originally built as meditation rooms. These have now been cordoned off to general public. A stone's throw away from the temple is Jallianwala Bagh. A place with a painful past, it is today, a tribute to those who were killed during the Jallianwala Bagh massacre. This is a Hindu temple dedicated to goddess Durga. The temple is designed on similar lines as the Golden temple. It also has a lake surrounding the temple. Sometimes called the silver temple because of the silver doors this temple can be reached in about 15-20 mins by rickshaw from the Golden temple. Sri Guru Tegh Bahadur Khalsa College or more commonly know as Khalsa College is a premier educational institution in the city. It is the oldest college in Amritsar. The building architecture shows its Victorian roots. The building is illuminated at night and is a wonderful spectacle. Situated about 30 KM away from the main city is the border between India and Pakistan. Situated on NH 1 or the Grand Trunk road, it is a major tourist attraction. The border has two ceremonies. The "Raising of the Flags" in the morning and "Lowering of the flags" in the evening. The ceremony is conducted with great enthusiasm and is watched by a sea of people on both sides of the border. This is a sight not to be missed. The ceremony in the evening attracts far greater crowds than the one in the morning. Make sure you get there early to get good seats or you are likely to be watching it from a very far of place. No visit to any city is complete without shopping and Amritsar is no exception. Once you are done with all your sight seeing and picking up some souvenir, head for the Lawrence Road. It has something for every one, from street food to high end fashion. About 100 Km from the city of Amritsar is the city of Firozpur which also has a border with Pakistan. The ceremony here is also elaborate. This border is quite significant as it has the Bhagat Singh Memorial. If you happen to be in that area around the 23rd of March try and make it to this place and pay respects to this legendary freedom fighter. There are many other places you can visit some of which are Ram Bagh, Ram Tirath, Pul Kanjari, Samadhi of Guru Angad Dev Ji, Jama Masjid Khairuddin, Samadhi of Shravan, Khoo Kalyanwala, and Shaheedi Bohr.